London and vans are two things I seldom combine. However, after a friend persuaded me to help out with their flat move, I had no option but to head into London with my large, orange van. To make matters worse, my friend had decided to relocate on a Friday. And this meant that the roads were packed. And the route from Cambridge to South London was slow, slow, slow, as I chugged my way along the M25, over the Dartford Crossing and onto the A2. After three hours behind the wheel, I have to admit that I grew a newfound appreciation for the Transit Custom's comfortable cab and hushed nature. Sometimes a van can leave your senses rubbed raw by the fact they lack any real noise supressing materials. But Ford has done a pretty good job of giving the Transit Custom the same levels of refinement as a large family car. Loading the Transit Custom with furniture is stress free process, thanks to the loadspace being lined with protective wooden panelling. However, there was one snag, with the rear wheelarches being uncovered by panelling and covered in metal grooves. Not only does this make it painfully easy to catch heavy items on them, but you're guaranteed to leave a mark. The Transit Custom's 'projector-style headlights' might sound impressive, but they come up short with average road illumination. One area where I cannot fault this van is the touchscreen navigation. Bright, easy to understand and filled with useful features, it made short work of London. The unit's a £705 option and managed to avoid the worse of the congestion as I made my way from Clapham to Golders Green. There are also handy shortcut keys to find things like a fuel station or cafe, if you have the urge to stop for a refill. 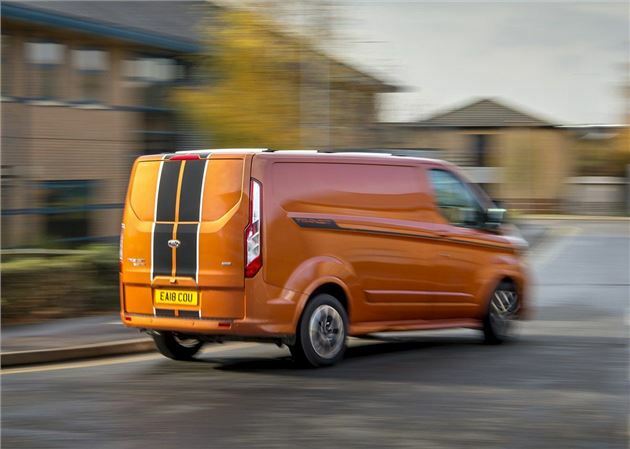 At low speeds and fully laden, the Transit Custom maintains its laidback driving dynamic with the extra weight having very little impact on the overall handling. The brakes remain smooth and responsive, which means you don't have those nasty jolts as the extra weight tries to push you whatever's in front. The steering also remains nicely weighted, which means you can change lanes without the body pitching heavily from side to side. As mentioned in previous updates, this version of the Transit Custom has blind spot monitoring that pretty much picks up anything that pulls alongside. This means you get a little yellow warning light in the door mirror if there's a cyclist or moped charging up the nearside. However, while Ford's van tech is first rate, the headlights of the Transit Custom are poor. From the exterior, they look great with their LED frames and 'projector-style' design. But in reality they are very average halogen headlights. And in the winter, with full beam, they really struggle to light up the road.